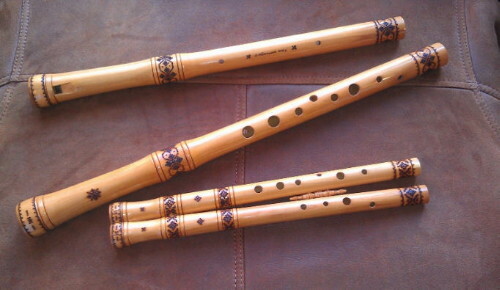 Sopilka (сопілка; fipple flute). A wind folk musical instrument of varied construction made of wood or bark. Generally cylindrical, blocked at one end, and with 6 to 8 finger holes (up to 10 since 1970), its related forms include the telenka, floiara, and dentsivka. The earliest-known example found in Ukraine is a mammoth-bone flute from the Paleolithic Period. The flute is known from the Princely era of the Kyivan Rus’ and is depicted on an 11th-century fresco in Kyiv’s Saint Sophia Cathedral. In folk tradition it was commonly the instrument of shepherds or part of trio ensembles (troisti myzyky). Today it is featured mainly in folk instrumental ensembles. Prominent sopilka performers have included Ivan Skliar, Y. Bobrovnykov, D. Demenchuk, and V. Zuliak.